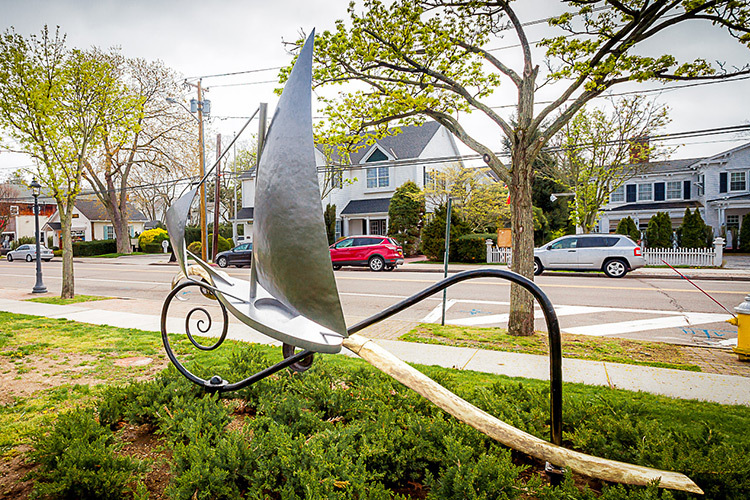 This sculpture was commissioned by the Bellport Chamber of Commerce after awarding the project to Spirit Ironworks through a design competition. The sculpture is titled; “Captain Bell’s Dream” after Captain Bell who founded Bellport Village. The sculpture consists of 3 major elements; 2 of which are unique to the Village of Bellport. Crafted from hollow formed aluminum, the boat represents an ice scooter which is a style of ice boat indigenous to Bellport Bay. The large steel scroll with the giant rivet is a stylized representation of a hand forged “Bellport gate latch”. This latch was designed and forged by the Shaw family of blacksmiths who were prominent members of the community during the 19th, and early 20th centuries. The wave, which was hand raised from brass and uses a stainless-steel support structure adds visual appeal and unifies this unique work. A total of 600 hours of labor were necessary to create this distinct public art sculpture.